The Nailers crashed out of the Derbyshire Senior cup on Tuesday night at the hands of Borrowash Victoria, a game which only came alive in the final ten minutes, writes Joe Malone. More changes were made by manager Peter Duffield as Aaron Pride made his long awaited return at right full-back, with Chris Jones moving to centre back alongside Luke Beatson. The first chance of the game came after just three minutes when a free kick from the left was whipped in by Gareth Davies and Luke Beatson was there to powerfully head the ball into the net, only for the flag to be raised by the linesman for an offside decision. Chris Jones then had a header well saved two minutes later when Davies played corner in and Jones was there to meet it six yards out. The Vics then had a good chance when David Hind latched onto a loose ball on the edge of the Nailers penalty area and his resulting shot was blocked well by Beatson to deflect behind for a corner. Tom Land was then left ruing a glorious opportunity for the Vics, when a corner from the right was sent in and Land found himself in two yards of space at the back post, only to head the ball two yards over the bar from seven yards out. Further chances came for the Nailers when Beatson had his shot saved from the resulting corner, and Aaron Pride fired over the bar from distance. Then, the best chance of the first half came for Belper on the stroke of half time when Mark Ward played a cleaver through ball to Jon Froggatt who was onside but could only stab his shot a foot wide of the post on the half volley. The second half produced the better of the football which saw three goals and better spells of pressure from the Nailers. Firstly, an appeal for a penalty by Sam Duncum as he looked to be tripped in the area, however the referee waved the appeals away. Chris Adam then created a great chance on the 57th minute as his ball forward to Ward was held up well and returned to Adam as he darted into the penalty area. Adam then skilfully went past three defenders as he edged towards the far post, however his right footed shot could only nestle into the side netting. A minute later Chris Jones had another headed effort from a corner, which was this time tipped well over the bar by the impressive Steve Smith. Chris Adam then linked up well with Mark Ward again as a familiar one-two inside the area released Adam to try and dink the shot over the ‘keeper, who spread himself well to make the block. A mix up in the Nailers defence then led to Scot Low picking the ball up from a pass back which led to an indirect free kick, eight yards out left of centre. David Hind struck it, and Scot Low got down well to make the save. Eventually on the 80th minute, when it seemed like a no striking effort could beat either goalkeeper, Borrowash Victoria took the lead. David Hind who had caused the Nailers centre halves problems throughout the game created the opening. The ball came to Hind on the left hand side who then squared up his run in the direction of Luke Beatson who was beaten for pace by the Vics number 9, and Hind’s shot was saved well by Low, only for Sam Kellogg to follow in and place the ball into the far corner, past the despairing Scot Low. It took just three minutes for a Nailers reply which made it one a piece. Anthony Rowley played Kieran Wells in down the right hand side, and as the two substitutes combined, Wells played a brilliant low ball across the box for Jon Froggatt to tuck away in the far left corner first time and level the score with seven minutes to go. But it was Borrowash who had the final say in the 89th minute, as the ever dangerous David Hind again beat the Nailers back line for pace on the left hand side, to run through on goal and clinically power the ball under the body of Scot Low and ensure the Vics had the final say. 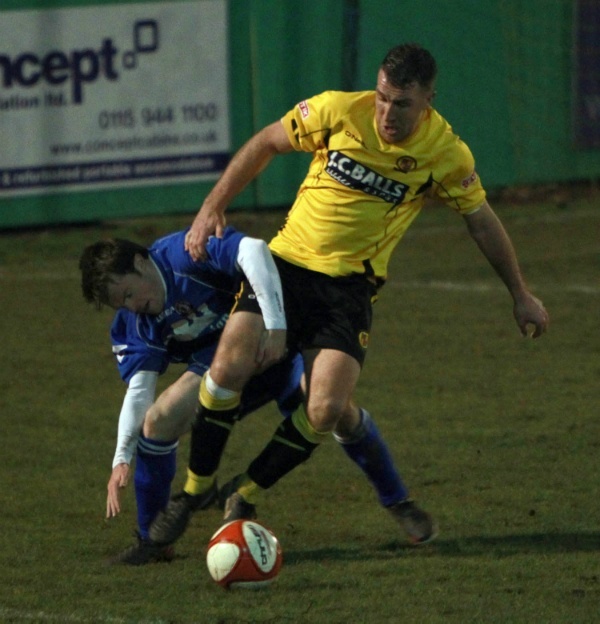 Belper Town: Scott Low, Aaron Pride (Shaun Roulston 82), Liam Davis (Anthony Rowley 36), Gareth Davies, Luke Beatson, Chris Jones, Sam Duncum, Steve Warne, Jon Froggatt, Mark Ward (Kieran Wells 70), Chris Adam. Subs: Scott Clapperton, Dave Ratcliffe. Borrowash Victoria: Steve Smith, David Leigh, Scott Staniland, Tom Land, Kane Jellyman, Chris King, Gurdeesh Lehal, Sam Kellogg, David Hind, Stef Frost, Jamie Pawley. Subs: Giacomo Senatora, Ryan Baker, Paul Campbell, Joe Illston, Lee Mitchell.